This blog has featured many experts and there are still many more who are working on bringing you a themed series to help your eczema child. There are yet many many more who are helpful over social media, and so for the past weeks, I took to Twitter and Google Plus to ask nutritionists ‘What Foods do you recommend for Eczema Child?’. 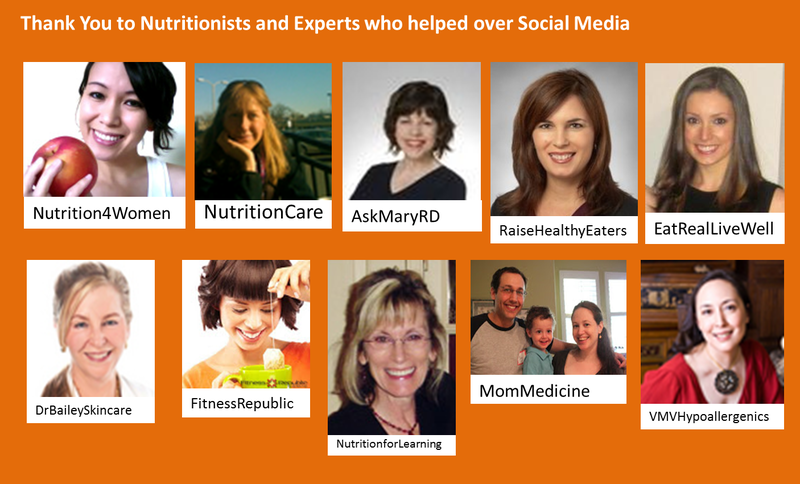 Many nutritionists and dietitians kindly offered their take, so much that pediatrician and skin experts also chipped in! My theory for eczema is caused by high acidity in the body. Recommendation: eat more alkaline foods & try magnesium supplement (65mg is the safe dosage for kids). Green vegetables, beans, peas, seeds, nuts and unrefined grains such as brown rice and whole-wheat products are high in magnesium. Some people also swear by magnesium oil as a topical treatment. My problem is acne and magnesium has helped a lot. I’ve found an article on magnesium on Livestrong here. Dietitian Judy Converse MPH RD at NutritionCare RDs often don’t realize dairy proteins frequently cause eczema, how to test, & that soy is not always ok as a substitute. Anti-inflammatory, probiotic foods are good for everyone. Though there is plenty of debate on this topic, this generally means eating a plant strong diet: Lots of fresh raw organic vegetables, greens, and fruits, along with traditional fats like those from organic meats or dairy products, butter, whole unprocessed, unsweetened organic coconut milk, olive oil, and oils from organic raw nuts and seeds. Humans have always made and eaten fermented foods. If you don’t like or can’t eat yogurt, kombucha, kim chee or sauerkraut, naturally cured meats, poi, or other fermented foods, or if you don’t have access to safe raw dairy products (which contain healthful fats and enzymes that are altered or lost when pasteurized), you can supplement with probiotics. There are now hundreds of probiotics products available. Look for diverse strains and high potency, over 15 billion colony forming units (CFUs) per dose. I often use much higher doses than that in my practice. Nutritionist Mary Hartley at AskMaryRD It’s an individual thing. Know which foods bother you, don’t mistake a diet cause for stress. Try eliminating dairy & increase intake of omega 3 and water. Any food intolerance could possibly be related though can have reactions to dairy that don’t seem like true allergies. Water intake can relate to inflammation and the immune system. Nutritionist Jan Katzen CN at NutritionforLearning High vitamin or DHA cod liver oil & other anti-inflammatory essential fatty acids (EFAs) (with supplementing nutrients for utilizing from whole foods) helps eczema. Dermatologist Cynthia Bailey MD at DrBaileySkincare Vegetables, carrots, no cow dairy, watch the gluten, minimize refined sugar. This is my opinion and not based on science. Pediatrician Cigal MD at MomMedicine Foods should be individualized by an allergist. Although most foods and supplements have not shown promise in eczema research, research is ongoing. For example, some studies suggest that probiotics may help relieve the symptoms of eczema in children. Probiotics are a type of live bacteria. They can be found in foods like yogurt and in some supplements. Most of these studies were done in other countries and tested different kinds of probiotics. So it is not clear what type of probiotics are most useful. “More research in this area is surely needed before we can make a definite recommendation,” says Cambio. Another food being studied as a benefit for eczema is tea. Although there is no definitive evidence, a few studies suggest that drinking black, green, or oolong tea may help relieve eczema symptoms. Omega-3 fatty acids found in fish and fish oil, which help fight inflammation, are also being studied for eczema. Note: above tips may not have been conclusively proven in studies but are friendly suggestions given over social media. For eczema and diet studies, see here.